Several residents in the Hollygrove neighborhood say they’re frustrated because they have trailers to live in but no electricity to make them livable. At least eight to ten homes in Hollygrove are now equipped with trailers for residents who wish to work on their home while living right in front of it, according to Herman Nathan. He said the trailers sit empty as they wait for Entergy to hook up electric service. Nathan said the trailers already have sewerage and phone lines. Entergy spokesperson Amy Stallings said the delay comes from a requirement that a licensed electrician inspect the property and obtain a permit before Entergy hooks up service. According to Stallings, once the permit is in place and the licensed electrician has inspected the home, it will take between five and seven days to have service installed. FEMA representatives said the process is going more smoothly in the city of Slidell where officials and Cleco (the power company serving Slidell) agreed that electrical contractors could hook up service without a permit. Those representatives said that New Orleans hasn’t waived that process, but that officials are working to streamline the process. Some residents aren’t waiting though, they’ve installed generators to power their temporary homes. In the back of the cafeteria at Ben Franklin Elementary, as New Orleans public school officials celebrated the reopening of the first district school since Katrina, it was a day of little joy for kindergartener Tyler Felix. The 5-year-old, a Franklin student before the storm, arrived Monday in a red polo shirt with the school insignia to face a jarring reality that left him dabbing away tears with a powder blue tissue. "Not one single member of his class returned," said his mother, Elise, adding that his teacher also would not be back. "He was kind of upset." Residents near a New Orleans-area oil refinery spill who moved back into their homes should not have been allowed to do so if those homes show oil damage, federal officials said Thursday. Some 1,700 homes were affected when Hurricane Katrina toppled a storage tank at the Murphy Oil refinery in the Meraux-Chalmette area. Oil from the spill mixed in with floodwaters from Katrina, flooding those homes. Housing projects destroyed by Hurricane Katrina will be rebuilt as mixed-use, mixed-income neighborhoods, with $1.8 billion planned to begin work in Louisiana and Mississippi, U.S. Housing and Urban Development Secretary Alphonso Jackson said Wednesday. "Within the next two weeks, we will begin to see results," he said, without giving details. 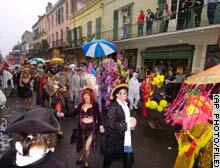 NEW ORLEANS, Louisiana (AP) -- Mardi Gras organizers promised Wednesday to roll out the city's signature celebration in February despite the widespread destruction caused by Hurricane Katrina. Tourism officials, float builders and parade hosts appeared before the City Council to insist the annual pre-Lent celebration -- part family party, part Bacchanalian blowout -- returns this winter. "We have to do this," said Councilwoman Jacquelyn Brechtel Clarkson. "We can't afford to miss a beat." DURHAM, New Hampshire (AP) -- The college fair at a University of New Hampshire gymnasium is a regular stop on Rae-Anne Mena's annual circuit through the Northeast. Her job is talking up Loyola University of New Orleans -- its Jesuit service mission, its strong core curriculum, its academic programs and sports teams. But this year, as students and parents snake along the rows of tables toward Loyola's, they look surprised to see her. "Are you under water?" several ask. "When will you reopen?"